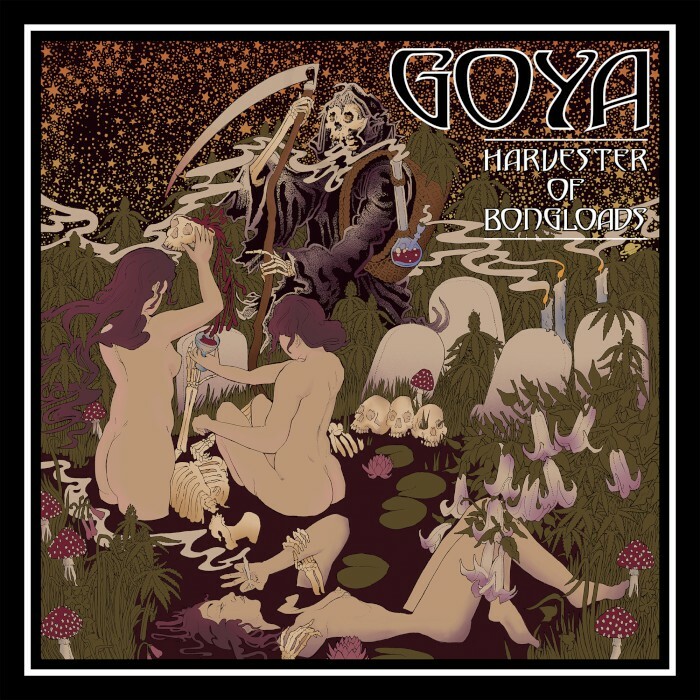 Kudos to whichever member of Phoenix, Arizona, trio Goya came up with the idea of calling their third album Harvester of Bongloads — a title that not only speaks to the megastoned nature of the band’s output but contains a reference to classic metal as filtered through anti-everything fuckall, which is pretty much the core of what guitarist/vocalist Jeff Owens, bassist Sonny DeCarlo and drummer Nick Lose have on offer throughout the four-track/40-minute outing. This, mind you, is the opener. Goya lead with this. On Harvester of Bongloads. One has to imagine it would be a challenge for the three-piece to preach more to the converted than they are here, from the wink-and-nod dogwhistle name of the record to the absolute desire to overwhelm a listener who is 100 percent looking to be overwhelmed in exactly this way — the kind of individual who might go, “Yes, please drown me in riffs.” Goya are happy to give it a shot on Harvester of Bongloads, and “Omen” is a key manifestation of that. 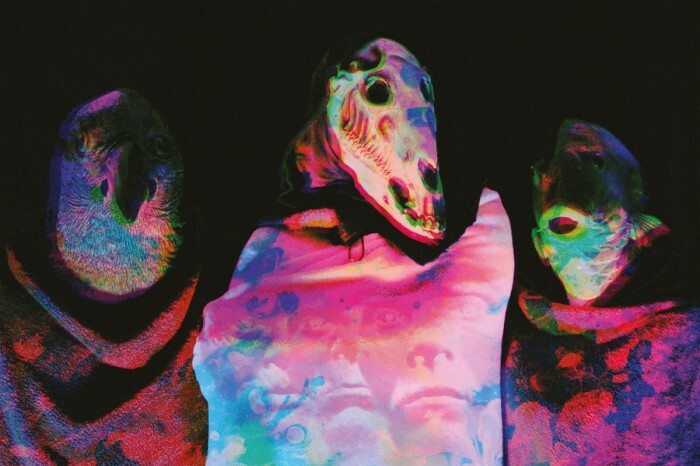 Its slow-motion plod is marked out first on drums and some far off manipulated noise, starting “I. Strange Geometry” quietly with its bassline and an eerie tension. I’m not entirely sure where the divides between the parts of “Omen” occur, and part of the reason for that is because the changes are so fluid, but that subdued opening builds subtly over the first four-plus minutes and gives way circa 4:30 to a full-tilt lumbering, Owens entering for the first verse after a swell of cymbal. For something that’s already been on for five minutes, the impact is immediate. 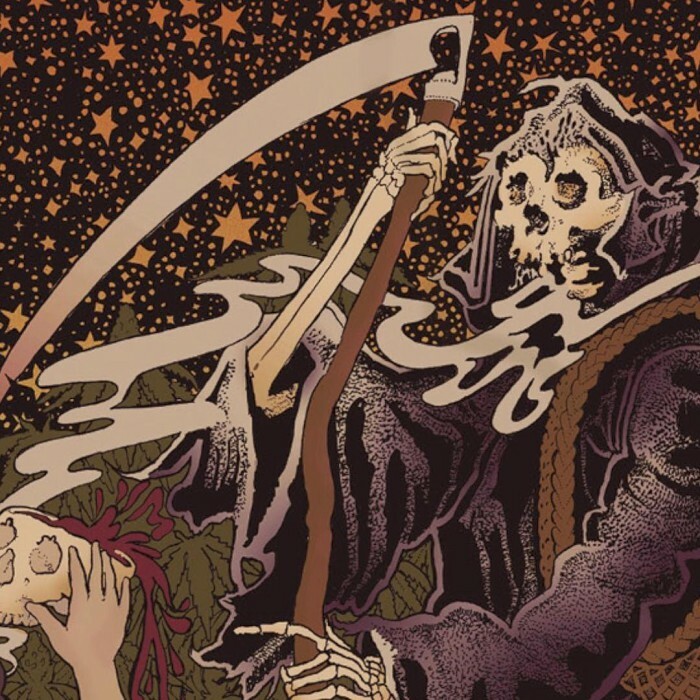 He, DeCarlo and Lose ride that groove for until shortly before eight minutes in, when the drums and bass drop out and the guitar introduces the next riff in classic stoner metal fashion. Is that the start of “II. Fade Away?” The lyrical telling of politicians destroying dreams and other such decay, so I’d believe it, but the actual line “fade away” is still to come, arriving as it does past the halfway point as the band have drifted from a long solo section at almost exactly the 12-minute mark into quiet psychedelia, the guitar in chill mode as the warmth of bass comes forward. It’s hypnotic, but doesn’t last. At 14:30, they launch into resumed tonal crush that carries them into “III. Life Disintegrates,” the rumbling, mournful conclusion of “Omen,” which ends with more fervent hits and a worthy crash for what’s come before it, shifting into the two-minute riff-roller “Germination.” An epilogue for the opening track? Maybe. It’s a quick play between groove and guitar solo, instrumental and ends in feedback, like a snippet of a longer jam, but it also feeds directly into “Misanthropy on High,” so it could be just as much an intro to side B as well. To-date, Goya have not put out a release — album, EP, single, whatever — that did not in some way build on what’s come before it. 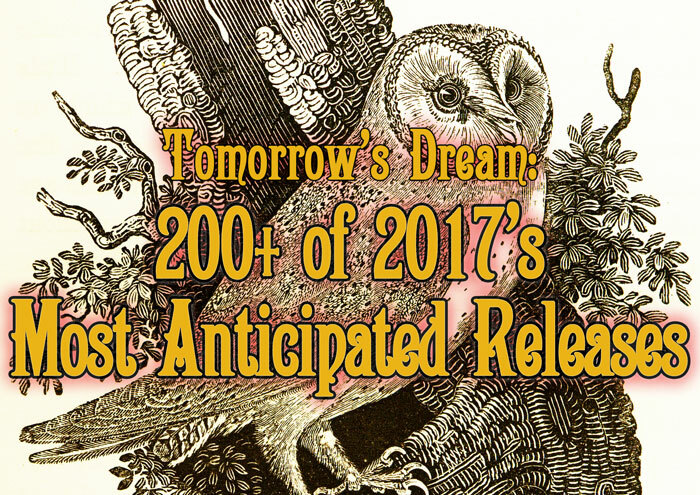 Their sound, heavily drawn from Black Sabbath, Sleep, Electric Wizard, Windhand, etc., has steadily become more their own, and Harvester of Bongloads is a next step in that process. The attitude behind “Misanthropy on High” — which if it’s not on a t-shirt yet probably should be; one has to believe it will surface as a motto for Goya at some point — is part of that, but it’s just as much the manner in which the three-piece seem to be fighting their own songs. It’s almost like “Misanthropy on High” has a will of its own as its 11-plus minutes play out, and as Goya are performing it, they’re also working to control it, like at any second the whole thing could devolve into sheer noise-drenched chaos, fall completely apart under its own weight. That they are ultimately in command of that process is a factor in making their work develop as it has over the course of their albums, and as they’ve grown into it, they’ve become immediately identifiable by sound despite whatever familiar elements might persist. “Misanthropy on High” is a near-perfect execution of that and a callout to the disaffected to join them in the toward-oblivion nod the creation of which one imagines is Goya‘s very purpose for being. Just as “Germination” fed directly into it, it leads to the six-minute closer “Disease,” which marks a relative uptick in tempo — closer to mid-paced, on some general scale — and finishes Harvester of Bongloads in a manner both acidic and kingly, Owens tossing out a few lines early before receding and coming back after the halfway point to make sure the emphasis on global decay and death is properly conveyed before they’re done. Rest assured, it is. A bit of shred follows in the last minute and a sudden cut to feedback and two last crashes end the album. The statement has been made, the point taken, the riffs meted out with duly punishing sensibility behind them, and as if to underscore the sincerity and lack of pretense at their core, Goya finish cold where one might’ve expected a long, stonerly fade. One could go on waxing critical about how subtle touches like that further distinguish their work from a crowded underground sphere, but I’m not sure there’s a point. Fact is, Goya have become something of a litmus test for those who’d take them on — either you get it and can dig it, or you don’t and you can’t. They don’t seem to care much either way, and perhaps that’s for the better. A group so outwardly, loudly dedicated to flipping off existence in general shouldn’t at the same time be necessarily playing at accessibility, even to a niche audience, but don’t take that to mean they aren’t likewise pushing themselves to progress in their mammoth, consuming approach. While they may be disgusted with the world around them, Harvester of Bongloads is clearly a labor of love.